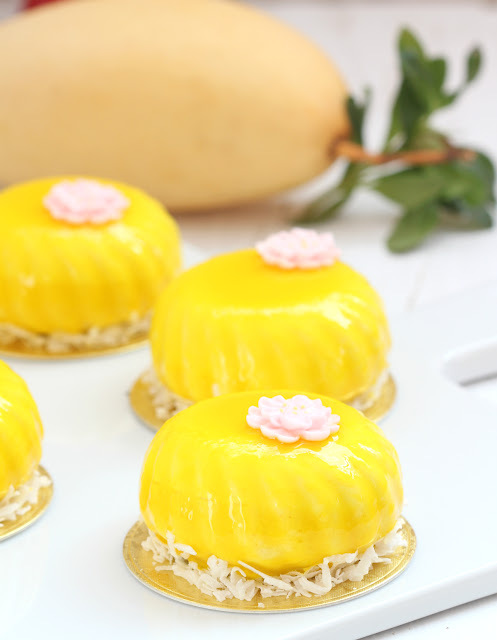 my bare cupboard: Mango-pomelo and matcha petit gateaux "
Made these pretty petit gateaux few days ago. 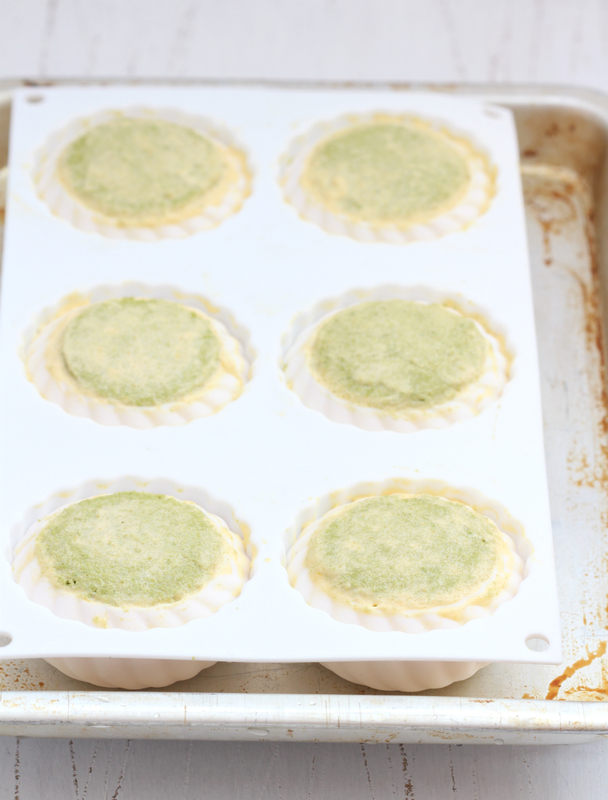 Need to take advantage of the weather as it is easier to make this kind of pastry when the temperature is below 25ºC. The glaze of these minis is more of a decoration than an actual glaze. Since I don't have enough store-bought natural mirror glaze, I decided to make it and made a few tweaks by increasing the amount of the ingredients and just added the leftover. The crumb shot of the filling is a bit messy but it tastes wayyyyy better than it looks! * Soak gelatine in cold water until softens, 5-10 minutes. * Bring sugar and water to a boil, stir until sugar is dissolved. Add the softened gelatine, with excess water squeezed out, and stir until gelatine is completely melted. Add in the cream, evaporated milk, coconut milk and mango purée, mix to combine. 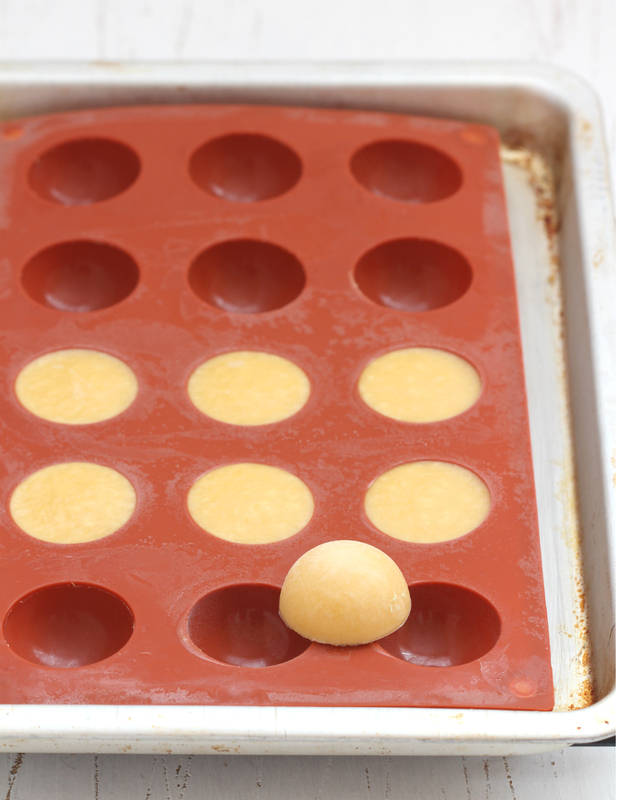 Take pan off heat, let cool slightly and pour mixture into the silicone mould. Freeze until set. * Beat whipping cream until stiff peaks form, do not over mix, chill in the fridge until needed. * In another bowl, beat cream cheese and sugar until smooth. * Combine mango purée and softened gelatine in a small heat-proof bowl, place bowl into the pan with barely simmering water. Heat until gelatine is completely melted. 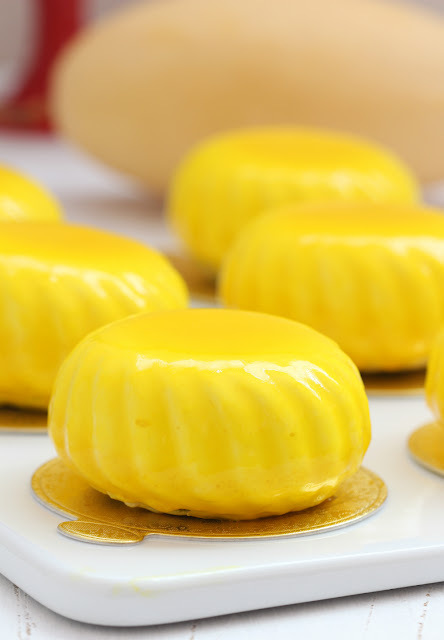 * Add melted gelatine to the cream cheese mixture and stir until well-combined, mix in mango paste. Add in whipped cream and mix thoroughly. * Beat cream and sugar until stiff peaks form, add in mango purée and paste, set aside. * Combine milk and softened gelatine in a small heat-proof bowl and place it in a saucepan with barely simmering water, stir until gelatine is completely melted. 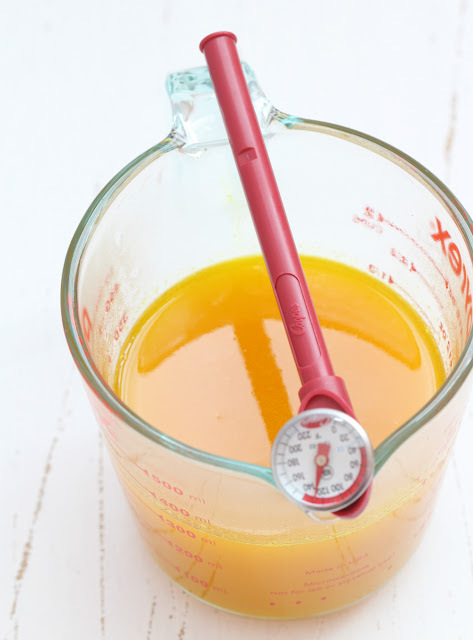 * Add in melted gelatine into the mango purée mixture, stir until well-combined. 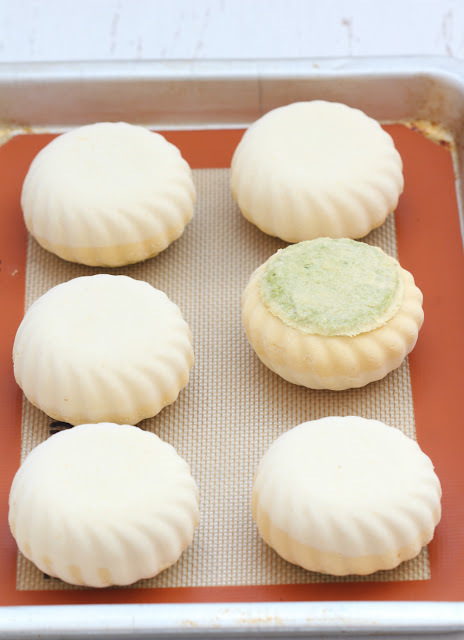 * Stir the cream cheese filling, pour or pipe mixture evenly into a 6-cavity silicone mould, dropping the mould several times to remove some of the air bubbles. 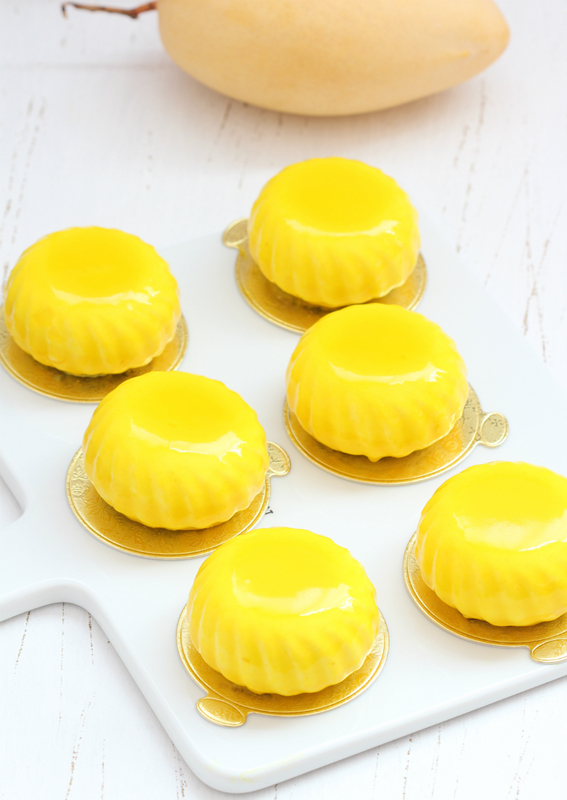 * Take out 6 pieces of mango pudding from the mould and place each piece on top of the cream cheese layer, gently pushing it halfway through. 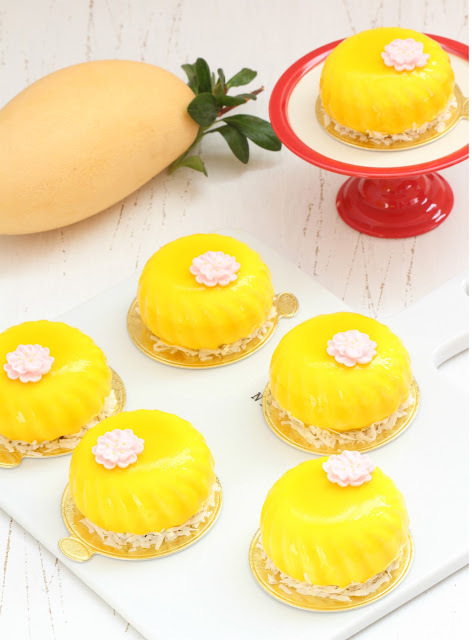 * Stir the mango mousse filling, pour or pipe evenly on top of the pudding and cream cheese layers, add in some pomelo flesh, pipe some more mango mousse enough to cover it. Add in a piece of genoise sponge, gently pushing it down, pipe more mousse along the sides, smoothing the top and scraping any excess mousse. * Freeze for about 8 hours or preferably, overnight. * Bring mango purée, water, glucose syrup and sugar to the boil. Turn off heat, add in softened gelatine and stir until completely dissolved. Stir in the mirror glaze and mix thoroughly. Add in few drops of colour gel, stir to combine. * Strain glaze through a fine sieve. Let cool to 86-90ºF before using. Depending on the ambient temperature, the amount of the glaze and some other factors, it will take between 20 minutes to 1 hour. 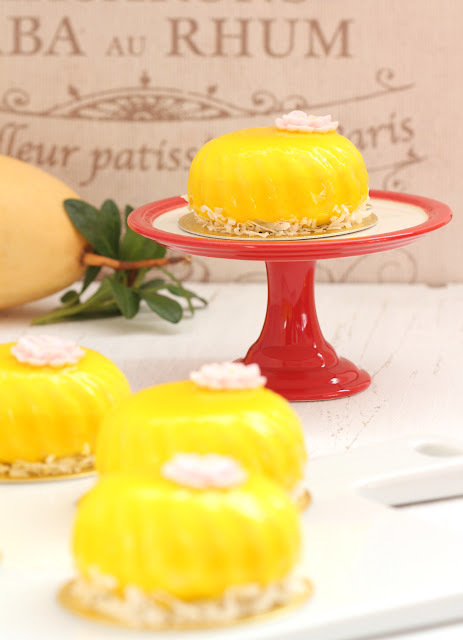 * Unmould frozen mango mousse, place in a wire rack. Put back into the freezer for about 30 minutes before glazing. * Stir the mango glaze, pour over each mousse until completely covered. Glaze twice or 3 times, scraping the excess glaze from the baking sheet and back into the cup. Heating gently, if necessary. 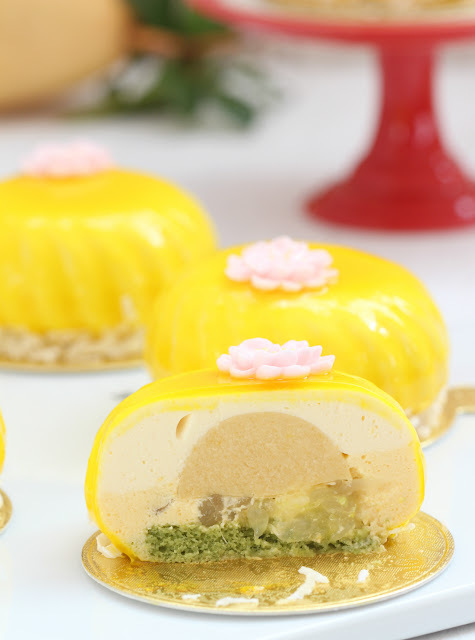 * Place glazed mousse into the fridge to set, about 10 minutes. Using an offset spatula, transfer each cake in a cake holder, gently scraping excess glaze from the bottom edges of the cake. Place back into the fridge to defrost, about 2 hours. * Decorate bottom edges with shredded coconut and top with sugar paste flower. Serve straight from the fridge.